The award winning 4* Galmont Hotel & Spa enjoys its unique location overlooking Lough Atalia with expansive views of Galway Bay. 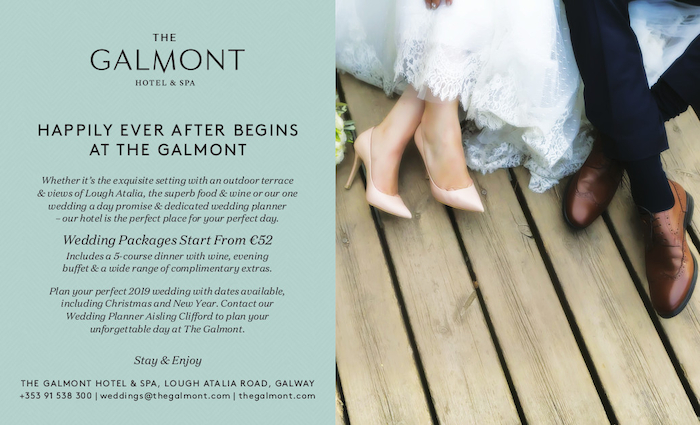 Offering several stunning and individual style of rooms, The Galmont Hotel provides the perfect backdrop to capture your beautiful wedding day images. With options suitable for both large and more intimate weddings, the hotel is designed with weddings in mind and is registered to conduct civil ceremonies and partnerships. Aisling Clifford is the dedicated wedding coordinator with 20 years’ experience in the hospitality industry. Aisling has a wealth of expertise and experience across many different and unique style of weddings and, along with the entire Galmont team, is committed to exceeding your expectations. With only one wedding a day the complete focus is on you - it will truly be a day to remember for you and your wedding party. With a reputation for complete attention to detail, this 4* hotel gives a five-star service. Upon arrival, the Veranda Lounge, with exquisite chandeliers, can cater to 120 guests in elegant surroundings complete with a private bar and access to an outdoor terrace. The Veranda provides an idyllic backdrop to enjoy al fresco pre-wedding drinks during the summer months. For a more intimate gathering of those nearest and dearest, the Level 5 Lounge can accommodate up to 20 guests. Lending itself to being as extravagant or understated as you wish, the Inis Mór Suite is The Galmont’s signature wedding space and allows brides and grooms to create a very personal touch. Vintage-style mirrors, modern chandeliers and antique candelabras give a classical and elegant element to the occasion. Continuing the celebrations into a second day, the attractive Veranda Lounge is perfect for a tasty barbeque or a drinks reception with finger food on the deck. The Spirit One Spa offers all the pre-wedding preparations, with a menu of treatments for brides and grooms provided by premium brand Elemis. The expert and highly professional team ensure it is the ideal place to unwind offering a haven of peace and tranquillity. The award-winning culinary team provides a spectacular array of seasonal and locally sourced ingredients across a five-course menu including evening appetisers. Wedding packages start from €52 per person with complimentary extras including the luxurious bridal suite with a Champagne breakfast and a 15% discount in the award-winning Spirit One Spa for the wedding party. The Galmont team can provide tailored packages to suit your requirements and look forward to creating special moments on your wedding day.